Wagyu, literally, “Japanese cow,” encompasses four distinct breeds: Kuroge (Black), Shorthorn, Polled, and Brown, and originates centuries ago in Japan. Because of Japan’s relative isolation and their reverence for the animals, the bloodlines have remained relatively pure and their lineage fiercely protected. The Wagyu cattle were originally used only as working animals, selectively bred for exceptional strength and stamina. They discovered quite by accident that the genetic attributes they had been cultivating—the prevalence of intramuscular fat for sustained energy—also contributed to the deliciously rich flavor and tenderness that have come to define Wagyu. Of the breeds, it’s the Kuroge that offers a superior eating experience and is the source of famed Kobe beef. Mishima Reserve American Wagyu herds trace their lineage to historic Japanese bloodlines. The very first bulls arrived in the U.S. in 1978 – not as a strategic business initiative, but as a diplomatic, international trade gesture. It wasn’t until the early 90’s that broader awareness of the breed began to catch on in the States. In fact, during that window of time, most of the American Wagyu beef being produced was being exported to satisfy increasing demand in Japan. 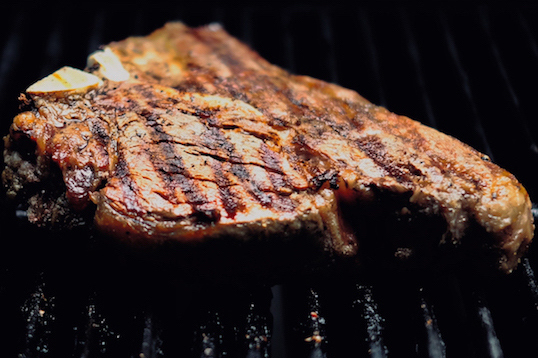 It was the late 90’s when Mishima Reserve founder, Shane Lindsay, began to supply American Wagyu beef to several influential chefs, including Wolfgang Puck of Spago, Thomas Keller of The French Laundry, and Tom Colicchio of New York’s Gramercy Tavern. They recognized the superior quality, amazing flavor, and tenderness of Wagyu beef, and wanted to be among the first to include it on their restaurants’ menus. Just as vintage champagne, beluga caviar, or a world-class automobile are best appreciated in the glass, on the tongue, or behind the wheel, we believe the remarkable qualities of Mishima Reserve can only be fully appreciated on the palate. The rich complexity of flavors and tenderness you’ll enjoy while eating it may defy words, but we think you’ll always remember the experience. Our luxury wagyu beef does have a distinctive look, one that’s immediately recognizable and easy to describe. You’ll notice its deep color, as well as the extensive and delicate marbling woven throughout. This intramuscular fat, which melts and permeates the meat during cooking, contributes to the “richness factor” of our beef – the more marbling, the richer the flavor. The reality of traditional meat production in the United States is that it’s optimized for volume and efficiency at the expense health and flavor. In tasting Mishima Reserve beef for the first time, people have compared the experience to enjoying a carrot pulled fresh from the garden versus one from the grocery store. In short, we think Mishima Reserve tastes the way beef is supposed to taste, only more so. Wagyu breeds are biologically and genetically different animals from Angus and other American cattle, and this is especially true when it comes to the chemical composition of their fat. Thanks to diet and longer growth periods, our beef is richer in Omega 3 and Omega 6 fatty acids, the same “good fats” that are present in wild salmon, tuna, flaxseed and other nutritious foods. products, delicious recipes, and news. Mishima Reserve is part of the Sugar Mountain family of businesses.